Chocolate Madras Cake - Do You Know The Muffin Man? Notes: I made this cake for work and started working on it earlier this week. The three Chocolate Orange Mousse Cake layers are flourless, using separately beaten yolks and whites to create lift. Flavour comes from orange extract and zest to which I added some orange oil as well. The cakes were still a little wet after 24 minutes, something I only discovered after I inverted them from the pan, so I baked one of them on a sheet to dry it out. These layers fell as they cooled, to a thickness of about 2 cm. For the Cranberry Compote, I used 100% cranberry juice mixed with orangecello in place of cranberry vodka. And for the Quintessential Chocolate Ganache with Walnuts, I used mostly bittersweet mixed with milk chocolates, rather than semisweet and unsweetened as the recipe calls for. 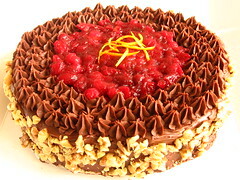 To assemble this cake, some of the ganache is mixed with the compote and walnuts, and spread between the layers. I found that the freshly made ganache was too liquid to frost the sides, so I let it firm up in the refrigerator. The rest of the assembly was easy, if a bit time-consuming. I should have pressed the walnuts into the sides while the ganache was soft so they would adhere better. The tanginess of the cranberries blends well with the rich chocolate (over 1 pound used in this cake). Because the ganache chills to a firm consistency, it gave the overall cake a brownie-like texture. Delicious, highly recommended.